The forum in Winnipeg was the seventh event in a two-year NEADS’ Job Search Strategies Forums Project, addressing practical aspects of successful transition from school to the employment market. Delegates represented a number of colleges and universities in Manitoba. There were also several participants from secondary schools. Student participants were attending the following institutions: Assiniboine Community College, Red River College, University of Manitoba, University of Winnipeg, Wellington College of Remedial Massage, Portage Collegiate Institute, Winnipeg Technical College and York University. Altogether about 75 people took part in the day-long employment session: students, graduates, service providers, employers, career counsellors/professionals and representatives from non-governmental organizations. The NEADS Winnipeg Job Search Strategies Forum included two workshop panels, an exhibit area, and one-on-one resume consultations with career counsellors or HR professionals over the lunch period. The exhibit area included displays and representatives from: BMO Financial Group, MB4Youth CareerOptions program, Manitoba Employment and Training Services, Manitoba Hydro, MYVOP (Manitoba Youth Volunteer Opportunities), Reaching E-Quality Employment Services (REES), RBC Financial Group, and Winnipeg Service Canada Centre for Youth. Jennifer Dillon welcomed participants, introducing herself as the Job Search Strategies Consultant for the National Educational Association of Disabled Students (NEADS). She explained that the current Forum in Winnipeg is the seventh of eight, preceded by similar events in Toronto, Edmonton, Victoria, Montreal, Halifax and Ottawa. The Forums started in August 2005, and the final one will take place in March 2007 in St. John’s, Newfoundland. These events bring together students, graduates, service providers and employers, to provide participants with practical job search strategies. Dillon said, “We hope the opportunities today, will help you develop strategies to move from academic success to challenging and rewarding careers.” She introduced the interim President and Secretary-Treasurer of NEADS, Mahadeo Sukhai. Sukhai welcomed participants, and introduced the NEADS board members and staff in attendance: Tim McIsaac from Manitoba; Margaret Shalma from Ontario; Julia Munk, Phase II consultant for the Equity Through Education Project; and Chris Gaulin, Website Architect and Project Manager. Started in 1986, NEADS was “founded by students for students;” in 2006, the organization celebrated its twentieth anniversary. 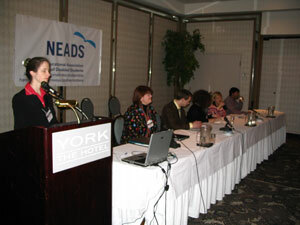 NEADS advocates for full access to post-secondary education and employment opportunities for students with disabilities. Sukhai said that as an organization, NEADS realized that “a lot of what we have to do is pay attention to transitions.” This includes the transition from high school to post-secondary education, and from post-secondary to graduate studies. “The largest transition is from post-secondary education to employment.” NEADS’ primary focus in the current project is on activities that facilitate the transition to employment, he said. Acknowledging BMO Capital Markets’ support for the NEADS Job Search Strategies program, Jennifer Dillon invited participants to watch the video presentation, Equity Through Education. In 2004, BMO Nesbitt Burns formed the Equity Through Education program, to help women, visible minorities, Aboriginal people and people with disabilities overcome workplace barriers. On May 11, 2005, BMO donated one day’s institutional commissions earned in Canada and the US, raising $1.6 million for organizations that provide educational activities or support. The company has given this money to seven organizations, of which four are in Canada: the Canadian Merit Scholarship Foundation, which provides financial assistance for post-secondary education; the Foundation for the Advancement of Aboriginal Youth; Pathways to Education, which assists at-risk youth; and NEADS. In the video, award recipients shared their testimonials, successes and gratitude for the program. Dillon thanked BMO for their support and thanked Stephen McDonnell, the company’s senior manager of Diversity and Workplace Equity, for his ongoing work. She encouraged participants to take part and ask questions, noting that this was an excellent opportunity for them to get involved. “The job market is challenging, and we can learn from each other’s experiences and knowledge,” Dillon said. She added that there would be a “chance for one-on-one,” and added that during the lunch hour, employment professionals would be available to assist with resumé consultations. She advised participants to take time to go through the exhibits. She pointed out that sign language (ASL) was available for people with hearing impairments. “Today is a great opportunity to get feedback….Be prepared to receive feedback. We are here to help each other,” Dillon said, noting that a report on the Forum would be available in approximately one month. Recognizing that people with disabilities were underrepresented in its workforce, BMO has focused on accessibility issues, starting a task force on education issues and job search strategies in 1992. The task force realized that there were several false perceptions about people with disabilities in the workforce. Most significant was the belief that people with disabilities were unable to do the job, or were suited only to limited jobs; another was that special treatment for employees with disabilities would cost too much. However, the reality is that the opportunities are unlimited, and that 80% of accessibility needs can be accommodated at minimal cost. Equally important is research indicating that people with disabilities do not take a disproportionate amount of sick leave. Changes in technology, such as the Kurzweil software program, have enabled companies to create a much more inclusive workforce. McDonnell said he is proud of his employer’s priority of inclusion in the workplace. BMO Capital Markets has implemented many of the recommendations developed by the task force report. BMO Capital Markets offers experimental learning, internships, co-op experiences, job shadowing and work placements, community outreach and partnerships. McDonnell highlighted two critical issues people must address when looking for work—education and experience. People often undervalue their education, he said, underlining the need to list all educational qualifications in job applications. Lack of practical work experience may be an issue, but McDonnell advised that this could be overcome by volunteering and including this experience in one’s resumé. The resumé is a marketing tool that should create a strong positive impression, McDonnell said. It is an inventory of academic achievements and work-related experiences, skills and knowledge. Reiterating that volunteer experience is just as valid as work experience, McDonnell underlined the importance of keeping in touch with previous mentors, professors, employers or volunteer experience contacts. “Keep your resumé up to date,” he said. Resumés do not work as they used to, McDonnell said. Often, the resumé is “touched once by human hands and then entered into a machine.” The resumé should focus on key words in the advertisement, and list all the applicant’s relevant experiences. McDonnell advised that people begin sentences with action words and avoid overuse of the word “I,” which should not be used more than twice. Resumés must give an excellent first impression, so typos, spelling and grammar are important. Ineffective resumés tell the story of the applicant’s life—“when Fluffy the cat died.” A good resumé is clear, concise, and easy to read, highlights the applicant’s skills, and focuses on recent jobs and volunteer experience. On the issue of disclosure, McDonnell reminded participants that they need not talk about their disability. He said they should know the boundaries about disclosure and articulate their accommodation needs. He reminded participants to focus on their abilities, not their disability, as companies want to hire ability. “We have welcomed people home from two major wars, with disabilities,” he said. Dillon thanked McDonnell and reminded participants of the importance of having supports in place. She introduced the next panellists, Carol Thiessen and Marianne Petrachek. Carol Thiessen said Manitoba Hydro is a provincial crown corporation providing both hydro and natural gas to residents of Manitoba. Manitoba Hydro offers a full range of career opportunities, Thiessen said, and she encouraged applicants to apply, as the corporation is “pleased to hire.” Manitoba Hydro is delighted with their successes and partnerships, especially with REES, Thiessen said, noting, “Those partnerships are critical,” and have contributed to the success of both employees and Manitoba Hydro. Marianne Petrachek said Reaching E-Quality Employment Services (REES) is an organization that works with both employees and employers. “REES has intake workers who will take you through all the steps to be job ready, at your own pace,” she said. Petrachek talked briefly about employers’ rights and responsibilities, and reminded participants that the employer has the right to employ and retain competent employees. Employees have the right to work in an environment that is free from physical, emotional and mental fear. In addition, employees have the right to be treated on an equal basis, and to be accommodated. Thiessen said a disability is only relevant to the job if it threatens the safety or property of others. Explaining that disclosure could promote safe and adequate job performance for the applicant/employee, she shared a story in which Manitoba Hydro accommodated a colour-blind employee to distinguish colour-coded hydro wires, thus protecting the employee from being electrocuted. Petrachek discussed whether “to disclose or not disclose.” Disclosure ensures that employees receive the appropriate accommodation they need to perform the job, she said, and reminded the group, “The employer can only accommodate what they know.” In addition, she said, applicants should not be afraid to go for an interview and then turn down the job. “You have to be comfortable in the job,” she said, adding that it is often not possible to know this until a person has worked in the position. Often it is hard for employers to understand certain disabilities, especially if the name of the disability is long and very medical. Petrachek advised participants to state where the disability occurs, and keep the condition from sounding frightening and mysterious. The goal is to make the employer comfortable, she said, suggesting that job applicants outline what they are doing to take care of themselves and take care of their disability. Most important, she said, is to keep the conversation positive, and avoid the words “can’t, don’t, problem and need.” Petracheck said that as soon as possible, the applicant should bring the conversation around to how they would perform the job if hired. They should ask to see the work area and equipment, to alleviate concerns on both sides. Petrachek asked participants how many had been asked about accommodation on the job; only a few hands went up. She reminded the group that employers can ask about accommodations (to perform the job, not to meet the needs of a potential employee’s disability). She advised participants to be honest about specific job aids and to explain how they will help or allow them to do a better job. Thiessen gave participants a handout entitled “Lawful and Unlawful Inquiries Before Hiring.” She explained that lawful questions deal with disabilities or health problems that can affect the position applied for. It is also appropriate for an employer to inquire into physical or mental disabilities or health problems that an applicant wishes to have taken into consideration for appropriate job placement. However, it is unlawful to request that an applicant list all physical or mental disabilities or health problems. Thiessen noted that this would lead to employees divulging disabilities or health conditions that are not necessarily relevant to job performance. It is also unlawful to make any inquiry regarding any physical or mental disabilities or health problems that are not necessary to determine a person’s ability to perform the duties of the position. To overcome barriers, Thiessen advised that job applicants must use their own judgment, instincts, and past experiences. “Some people are just curious. Sometimes it is best to just handle it,” she said. In most cases, a clear, positive explanation will help overcome curiosity. Petrachek suggested that applicants point out that their disability has not limited their personal achievements and successes, and that they offer examples of how they have creatively overcome barriers. However, she cautioned, “There is a fine line between confidence and cockiness.” It is important to appear eager and enthusiastic about the position, but not desperate. “They called you in for the interview,” Petrachek said. Petrachek noted that if an applicant is using a hearing interpreter, it is important to explain that the applicant is answering the questions, not the interpreter. During the interview, she said, it is important not to underplay volunteer work; this is “a chance to brag.” Applicants should use the interview as an opportunity to convince the interviewer of their interpersonal skills, and their ability to maintain good relationships with co-workers. “You need the support of your co-workers,” she said. In addition, she advised applicants never to respond defensively, angrily, or impatiently, but rather try to learn from any negative experiences. Ignorance, not malice, is usually behind an interviewer’s inappropriate questions. Petrachek suggested that if the interviewer asks questions that are too personal or inappropriate, the applicant should shift the conversation to the opportunity and his or her abilities. If an interviewer remains doubtful that the candidate can perform the job, the applicant should explain in detail how they can. It is a good idea to ask for a chance to demonstrate one’s abilities, Petrachek said. Employees are not entitled to the exact or ideal accommodation that they want, but are entitled to reasonable and appropriate accommodation. She asked whether it is true that research shows less than a 5% performance gap between employees with disabilities and those without disabilities, with no difference in safety records. Again, she said, this is true. She asked whether treating all employees the same is non-discriminatory. This is false, she said, since often the same treatment results in direct or indirect discrimination against certain employees. Thiessen asked whether diversity makes good business, legal and ethical sense; she answered that this is very true. Thiessen and Petrachek left participants with a quote: Preparedness+Opportunity=Success. Thanking Thiessen and Petrachek, Dillon said there would be a question and answer session after the break. She introduced the fourth panelist, Cateland Penner. Cateland Penner told the group that she was going to demonstrate how to interpret a provincial job ad, and offer suggestions on how to apply for provincial jobs. Penner presented an example of an Employment Opportunity Notice (EON), highlighting the qualifications required in a particular advertisement. She said that later, she would show the successful applicant’s cover letter and resumé. She said she had provincial Freedom of Information Protection of Privacy Act approval, and that the applicant had given permission for her to share this information. Penner said that while the EON lists “assets,” the Province considers all applicants, and will also consider those without the specified assets. When the EON states preference will be given to women, Aboriginal people, visible minorities, and people with disabilities, no other applicants will be considered until all applicants in these groups have been ruled out. Penner emphasized the importance of researching the position, and suggested using a department’s Web site or the newspaper to research its priorities, current initiatives and vision. In addition, she suggested that job applicants speak to people in the organization and look at jobs with similar duties. Applicants may ask Human Resources for a complete job description. Penner emphasized the importance of the closing date, noting that the deadline for competition is very definite. She recommended that applicants not send their resumé and cover letter late, and that they ensure material is sent to the person cited in the ad. If there is an equipment failure that will cause an inevitable delay, it is vital to contact the employer with an explanation. Penner explained that it takes time for a review committee to meet, and scheduling can often be very difficult. When employers consider equivalent education and work experience, education and experience may be taken into account if they are different from those specified. Relevant education should require the same length of time as that noted in the ad. In addition, applicants should clearly identify where they have gained experience. In any advertisement, one of the most important things to note is the essential criteria. Each ad contains the essential criteria for the position; usually the most important criteria are listed first, in the section on qualifications. Penner noted that if a candidate does not meet the essential criteria, they will be “screened out.”. The essential criteria will be used to frame interview questions. When preparing for an interview, applicants should consider the skills they have gained in previous job experiences. They should think of the best examples of those skills; this will enable them to come into the interview feeling well prepared. They must also be able to explain how their work history best demonstrates their experience. Most important, applicants should be specific about how their prior work history relates to the current job. Even if an applicant has no applicable experience, they should use examples of transferable skills and experience and demonstrate how these would apply to this position. Penner illustrated how to talk about skills gained from previous jobs, noting it is important to mention how often, and how recently, a certain task was performed in the past. It is important that each task or skill mentioned be directly related to the requirements of the job in question, she said. It is vital to pay attention to foundational skills. Certain skills can be found in almost every job ad: organizational skills, interpersonal skills, verbal and written communication skills. Job seekers should learn how to talk about these skills in a positive manner. In addition, they should be able to give examples of how they displayed these skills in former jobs. A participant said she was unfamiliar with hearing “health” discussed separately from the umbrella of “disability,” as in, for instance, references to “disability and health services.” She said in the community college environment in which she works, “disability services” include health issues. Carol Thiessen said there are many definitions of the concept of “disability.” Most organizations define it slightly differently, and some do not set out their own definition at all. She said that at Manitoba Hydro, if an employee self-defines as having a disability, that is all the clarification needed. Other workplaces, though, require sub-categorization—for instance, whether the disability is physical, mental or emotional in nature. Thiessen said that to come to consensus on a universal definition of disability would probably require a daylong seminar of its own. A participant commented that she has worked in disability-related organizations and groups for years, and they have always used self-definition as the key factor in defining disability. The best definition is the one a person with a disability defines for him or herself, she said. The participant also said that in her experience, accommodations such as flex hours have been a problem for employers. She asked whether the climate seemed to be changing toward such things. Carol Thiessen said that at different organizations, the work culture could differ even within each department. Sometimes, employers see work-from-home arrangements as limiting employee productivity. Thiessen said that her experience at Manitoba Hydro has revealed differing inter-departmental attitudes: she started in the company’s marketing department, where she was expected to be in her office most of the time. Now, in Employment Equity, she has been given the flexibility to work from home. She said, though, that at Manitoba Hydro and many other large companies, any formal request to work from home must be considered on its own merits. A participant asked how, in today’s electronic environment, a job seeker could know that resumés sent via email were being opened and read. In addition, she said that some job ads seem unclear when outlining specific academic requirements, versus the work-related skills being sought. Marianne Petrachek responded that she would hope employers would make the academic and employment-related requirements for a particular position clear in their job advertisements. She also said that most email programs have a “request read receipt” option that allows a sender to request that the recipient send an automated confirmation notice when a message is opened and read. A participant commented that for the longest time, he didn’t know the medical nature of his disability, since testing was inconclusive. Not knowing the scope of one’s disability makes it difficult to know how one would interact in social or workplace situations, he said. “It’s hard to seek accommodation for something if you don’t understand it yourself.” The participant commented that sometimes, traditional accommodation categories are not sufficient to fit all disability needs. Stephen McDonnell said he agreed with the participant’s comments. Some in the workplace have disabilities with social implications, and cannot be accommodated with “things”, such as modified equipment or computer software. McDonnell said that sometimes, the best thing is for the new hire to consent to talk with others in his or her department about the disability and how it might affect social interactions at work. For those with disabilities that have social implications, the best accommodations often involve being surrounded by coworkers who are supportive and understanding. A participant commented that a lot of employers seem to “talk the talk, but not walk the walk,” when it comes to employment equity commitments. In many cases, the jobs set out for employment equity hiring seem to be menial tasks, rather than career-oriented positions. Stephen McDonnell agreed with the participant that some companies need to do more with regard to equity hiring. But he said that employment equity-designated jobs are not the only positions for which a company will consider people with disabilities. McDonnell said it is important for job seekers with disabilities to ensure the positions they are applying for match their skill sets, rather than limiting themselves to certain defined positions. Marianne Petrachek commented that employers will hire based on an individual’s abilities first, rather than his or her disability. A participant said that Manitoba Hydro has its own medical team on staff, and asked whether this was common among companies. Carol Thiessen said most companies do not have their own medical staff; rather, they hire medical consultants. She said Manitoba Hydro has a substantial budget and a strong commitment to hiring people with disabilities, and having a medical team on staff is linked to this commitment. She said that many large companies do not even have long-term disability as an option, while Manitoba Hydro does offer access to such benefits after a year of employment. Thiessen suggested job seekers carefully research prospective employers, and look toward the progressive ones to match their needs. A participant working in the non-profit sector mentioned that many non-profits have small budgets that do not allow for complex accommodation needs to be met. She asked how people working in such environments could get around the problem of budgetary constraints. Carol Thiessen said she had been formerly employed in the non-profit sector, and is well aware of these concerns. She said that if a person with a disability is the best candidate for the job, it makes good financial sense for a non-profit, or any other company, to do what it takes to make accommodations. That said, she suggested a good strategy is for the job candidate to put together a detailed proposal on what accommodations he or she would need, and to do research into the most cost-effective ways to meet these needs. Outline the costs involved, and how the investment will benefit the organization, she said. If individuals do their research and help the executive director and board justify spending decisions, management will appreciate the help and be more likely to approve the expenditure. Kelly Mahoney, Director of Career Services and Co-operative Education at the Asper School of Business at the University of Manitoba, said she was honoured when asked to speak at the NEADS Winnipeg Job Search Strategies Forum. But she was worried when told she would only have 20 minutes to discuss preparing for an effective job interview. Mahoney said she normally conducts this workshop in an hour and a half, and in her previous job as a career consultant, she sometimes spoke for four hours on the topic. Mahoney said she would try to give as much advice as possible in the limited time, by offering tips to delegates as part of a four-step approach to interview preparation. The first step in any job search is for the candidate to realize that he or she is in the business of selling himself or herself. To be effective, the candidate must know his or her own strengths, weaknesses, interests, aspirations, and relevant previous experiences. It is also important to know what has been learned from each of those experiences and elements, and how they have contributed to making the person who he or she is today. Going into a job search, the most important thing to for an applicant to know is the skills he or she can offer a prospective employer, Mahoney said. In reviewing past experiences, academic, volunteer and extra-curricular pursuits should not be discounted. The candidate should focus on these activities, and think about the transferable skills that have been either learned or honed while doing them. Many of these skills can be offered to an employer as assets. As another part of self-assessment, the candidate should ask others—family, friends and former co-workers—to identify his or her key skills and assets. Often, Mahoney noted, we are our own worst critics, and may not focus on some of the skills that others see as strengths within us. Mahoney advised job seekers to keep all job descriptions after they have applied for the job. Many people send in their applications, then throw out or delete the job description, only to wish they had kept a copy of it when it comes time to go for an interview. Studying job ads is a key step before any interview. Mahoney advised going through the ad with a highlighter, and highlighting all the “hard” and “soft” skills indicated in the position requirements. The job applicant should think about how he or she can demonstrate the previous positive use of each of these desired skills. Mahoney noted that Behaviour Descriptive Interviewing (BDI), which involves formulating interview questions designed to make the candidate relate real-world examples to how they have used desired job skills, is becoming increasingly common. She said most human resources professionals are trained in BDI. She suggested a method called SOAR, around which job candidates can plan stories they might be able to use in a job interview. SOAR is an acronym for Situation, Opportunity, Action, and Results. Mahoney said each SOAR story should be able to be told in two minutes. The first 30 seconds should discuss a situation that came up in a previous job or volunteer position, and show how that situation created the opportunity for the candidate to display knowledge or creative problem solving. The rest of the time is spent discussing the action the candidate took to deal with that situation, and the way in which the action taken yielded positive results for the organization or the customer. Many candidates worry about the weakness-related question. Mahoney suggested job applicants should focus on a particular weakness he or she has identified, and has taken steps to resolve. The weakness should be explained, along with the process through which the person has attempted to turn that negative into a positive. Mahoney said “Tell me about yourself” is an invitation to focus specifically on relevant work history, job strengths, and work-related accomplishments. It should not be answered with details of where the candidate was born and raised, what he or she likes to do on the weekend, or any other details with no job relevance. The question should be answered in about two minutes. It is important for an applicant to know as much as possible about an organization he or she is interviewing with. They should find out about the scope of their operations, their products and/or services, their accomplishments as an organization, and other key details. A job applicant’s knowledge of a company adds a level of credibility to his or her candidacy for a position. The Internet has made relevant details about a company’s history increasingly easy to obtain. A company’s Web site should be the first place an applicant looks for information, Mahoney said. Within the Web site, company reports, press releases and other documentation will provide important details that can be used in an interview. Another potential source of information is someone who has worked for the company. The applicant should find out if someone in his or her circle of friends knows anyone with ties to the company, and talk to them about their experiences. At some point in the interview, there will usually be a natural place for the candidate to introduce his or her knowledge of a company, but if this does not come up, it is important to find a way to fit the information in. The interviewer should be aware that the applicant has taken the time to learn about the organization. Many candidates say “no” when an interviewer asks if they have any questions. These people miss a perfect opportunity to show their interest in the company and position, and to demonstrate that they have given some thought to the matter, Mahoney said. She suggested candidates prepare a list of potential questions before going to an interview. These should focus on the organization and the scope of the position, rather than on “me” questions—such as salary, benefits or vacation allotments. What are likely to be the first priorities in this position? What new opportunities might arise from new business the company has built, geographic expansion or other factors? Mahoney said the key to an effective job interview is good planning. The applicant should have copies of all relevant documents (resumé, job ad, transcripts); ensure he or she knows the names of all interviewers, and has a contact number in case he or she might be late for the interview; arrive ten minutes early to demonstrate promptness (any earlier will make the interviewer feel rushed); turn off cell phones or pagers before going in to the interview; and determine what to wear the night before the interview. Samantha Rayburn, Personnel Manager for Wal-Mart, has been a member of the company’s Recruiting and Selection Committee for four years. She started working for Wal-Mart as a greeter at age 16. Rayburn said that having a disability and working in a people-focused role was an early eye-opener for her. She said people would make comments on her stature and on her working with a disability. Rayburn said dealing with people’s reactions and comments was a positive experience, in that it made her more comfortable with herself. Rayburn later became a cashier, and the positive experiences she had dealing with people’s perceptions allowed her to work with Wal-Mart management to articulate the accommodations she would need. The cash register was too high, so management built a platform to suit her needs. Rayburn described attending university while she was moving into Wal-Mart’s Recruitment and Selection Team. She pursued undergraduate studies in Labour Relations and Workplace Studies at the University of Manitoba, since it related to her work at Wal-Mart. The program had an internship component that Rayburn undertook at a Canadian financial institution’s human resources department. This internship allowed her hands-on experience, and helped her develop many useful skills; she recommended students pursue any internships to which they have access. Rayburn is currently enrolled as a Master’s candidate in Disability Studies at the University of Manitoba, while still working as a Wal-Mart personnel manager. The challenges of balancing graduate studies with work have taught her more about herself, and about the need for people to know their own limitations. While juggling work and life is a challenge, it is important to quickly learn to strike the right balance. Rayburn told job seekers with disabilities not to be afraid to be an educator in the workplace. Defuse perceptions of disability and accommodation by not being afraid to let people know what you can and cannot do, Rayburn said, adding that employees should not fear asking for accommodations. Employees with disabilities should work with their employers to determine the steps that should be taken to ensure they can do their jobs while keeping their own needs in mind. Robert Pankhurst described his experience as a student with a disability employed through the Manitoba government’s CareerOptions for Students with Disabilities program. CareerOptions is a branch of Manitoba’s STEP Services, which focuses on career-related employment for students and youth through part-time, summer and cooperative work term opportunities. CareerOptions offers high school and post-secondary students with disabilities a chance to gain on-the-job experience and skills through office, labour and research-oriented positions with government organizations. Pankhurst began working with Manitoba Justice in June 2006 through the CareerOptions program. He worked full-time in probation services until starting university that September, and has continued on a part-time basis (10-12 hours per week) since then. Pankhurst said that when students register for CareerOptions, they do not know which department they may end up working in. Given the number of government departments, he said, this can be a daunting prospect. When Pankhurst was called for an interview with Manitoba Justice, he knew nothing about the department. Pankhurst said a student’s best strategy in this situation is to prepare for a variety of questions about past experiences and skill levels. He also suggested students should be ready to “interview the employer,” asking the interviewer questions about the job, the supervisor or other relevant concerns. In the civil service, said Pankhurst, it is important to remember the organization’s primary function: serving the public. This means approaching work-related activities with an open mind and positive attitude, and being ready to find solutions in any situation. He also noted that being part of a “professional” work environment can be daunting for youth, whose experience typically includes jobs in the areas of fast food or retail service. Working in government has taught Pankhurst a strong work ethic, respect, and other attributes he will carry to other areas of career and life, he said. Pankhurst advised students to be aware of what they want from a career, and to develop a career plan to help shape their future. He suggested students consider using extended networks to learn about various career options. If someone the student knows is working in a field of interest to the student, he or she should find out whether they can talk to them about the positives and negatives of that field, perhaps even arranging to job-shadow that person. “You’re in the driver’s seat of your own career path, and you’re responsible for your successes and failures,” Pankhurst said. Mahadeo Sukhai, interim president of NEADS, discussed the organization’s history, noting that NEADS’ key objective is to advocate for full access to post-secondary education and employment opportunities for students with disabilities. To this end, NEADS has developed several resources over the years to link students with disabilities with employers who are looking to hire. Some highlights of NEADS’ employment-related work include creating an Employment Advisory Council to NEADS in 1994; launching the Investing in the Future Mentorship Project in 1996; and holding Student Leadership and Employment Forums from 2001 to 2003. The NEADS Online Work System, commonly known as NOWS, was launched in 2003 as a Web site to link students with disabilities with employers recruiting for job opportunities. Students can post resumés and cover letters, while employers can post job opportunities and gain access to a database of job-ready candidates. There is no cost for either job seekers or employers using NOWS. Sukhai noted that NOWS currently has more than 1,300 students and graduates registered as job seekers, along with 81 registered employers representing 22 industries. NEADS hopes to have even more industries represented in the near future. Those interested in exploring NOWS can register on the Web site, www.nows.ca, Sukhai said. Julia Munk, project consultant for NEADS’ Equity Through Education Scholarship and Mentorship Program, explained that with this initiative NEADS is currently in the second phase of its Equity Through Education project. She is in the process of reviewing the first round of scholarship applications, and the Association is looking at awarding scholarships in undergraduate, graduate, college and CEGEP categories. Munk noted the scholarship criteria look at how well-rounded a student is; it considers extra-curricular and volunteer activities; and it determines how a student’s academic choices might relate to his or her chosen career path. The scholarships for post-secondary students with disabilities are valued at $3,000. NEADS is also offering a community group award to campus organizations doing work related to accessibility. The award offers up to $5000 each year, to help cover the costs of forums, conferences, or other activities related to campus accessibility. Munk said NEADS is also currently in the research phase of a cross-disability mentorship program, which would link employers with disabilities with students with disabilities who are interested in exploring a variety of career fields. The mentors would help students answer questions related to disclosure, accommodation, rights, and other relevant issues. The research is still in its early stages, as the organization wants to ensure that the needs of a wide range of students with disabilities will be met by the mentorship program. A participant asked about the criteria for student applicants to the CareerOptions program. Robert Pankhurst said students must maintain the full course load requirement for students with disabilities—40% at the University of Manitoba. To qualify in the part-time option of the program, students must maintain the same student status that they had the previous year. Pankhurst also noted that students can apply for a second summer term in the program, after successfully completing one summer. A participant asked the panel for their thoughts on clothing choices for job interviews. Samantha Rayburn said job seekers should dress appropriately for the workplace; don’t wear anything revealing, she advised. Kelly Mahoney agreed, noting that job seekers should be perceived as professional, and should dress up for an interview. In the past, the adage was that “you should dress as if you were already an employee of the company.” Now, Mahoney said, applicants should dress a step above workplace attire—wear a full suit, for instance. A participant suggested interview attire depends on the employment being sought. If you were working with street people, she noted, it would be appropriate to dress in simple, casual attire. She said it was good to hear panelists use the term “challenges” in place of “weaknesses,” since the former suggests something that can be improved upon, while the latter suggests something people must just learn to live with. Mahadeo Sukhai said registered participants would be emailed a link to a questionnaire asking for feedback on the success of this event. The Job Search Strategies team would like feedback regarding participants’ thoughts on the day’s proceedings, and would like to know how useful participants found the presentations and ideas shared during the Job Search Strategies Forum. The more responses received, Sukhai said, the more representative the data would be. In addition, feedback generated from this Forum can be matched to that from previous forums, and used to make the upcoming March event in St. John’s even stronger. Jennifer Dillon thanked participants for attending, and for voicing their questions and opinions. She also thanked the speakers, exhibitors and NEADS representatives who helped make the Forum a success. Dillon noted that when participants were planning to attend this event, they might not have been clear on the most effective job search strategies or the specific considerations job seekers with disabilities should keep in mind when looking for employment. She said she hoped the information shared throughout the day had been helpful. Create a success team, made up of friends, family, instructors, human resource professionals, and anyone else who might be able to offer advice on job search efforts. Dillon noted that personally, she had had a recent experience in which she had thought afterward that if she had had a success team in place, the results might have been more beneficial for her. Gain experience. Employment, volunteering, academic and extra-curricular pursuits, as well as internships and mentorships, can all help prospective job seekers develop important skills and attributes sought by employers. Dillon noted that students should constantly re-assess their skills, and determine how these will help them in career pursuits. Collect good references. Dillon said job seekers should ensure they maintain a carefully thought-out list of people who can speak to their skills in the workplace, and in other pursuits where transferable skills are utilized. Use the job ad as a tool to evaluate the skills employers are seeking in a particular career field. Knowing these skills in advance can help job seekers properly prepare for interview questions. Think about disclosure. Knowing what, how and when to disclose information about a disability can help alleviate some of the fears surrounding accommodation. The issue of disclosure is different for all people with disabilities, so it is important for each person to explore his or her own thoughts on the subject. Develop good job search tools and skills. Developing and regularly updating resumes and cover letters, and honing organizational and time management skills, will ensure prospective job applicants are always prepared for the job hunt.